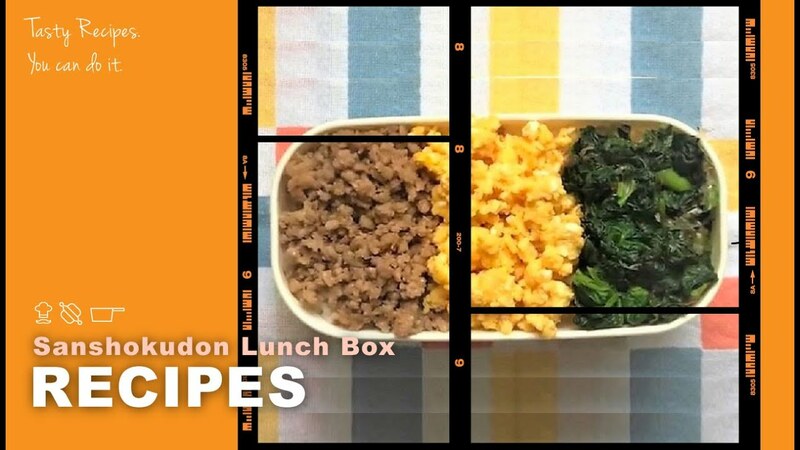 Sanshokudon Lunch Box (three-colored lunch Box) which looks beautiful and can be easily prepared with simple ingredients! This dishes is colorful with well-balanced nutrition. It is a delicious lunch box that loved by Japanese since the taste of ingredients seep into the white rice, and is delicious even if it is already get cold. Even beginners can easily make it. 1. Make a Chicken Soboro. Put minced chicken meat, sugar, sake, and soy sauce in a frying pan, mix it well, heat it up with medium heat and mix it well. Japanese likes to add minced ginger also. Heat up the stirred eggs in a frying pan, add sugar, sake and salt and mix quickly over medium heat. Boil the spinach in boiling water, and move to cold water. Then, squeeze the water tightly and chop into small size. Mix it with soy sauce and dried bonito. 4. Serve warm rice in a container, top it with Chicken Soboro, Egg Soboro, and Vegetable Soboro, and you’re done!